This Bookreporter.com Special Newsletter spotlights a book that we know people will be talking about this spring. Read more about it, and enter our Spring Preview Contest by Wednesday, March 21st at 11:59am ET for a chance to win one of five copies of BARBED WIRE HEART by Tess Sharpe, which is now available. Please note that each contest is only open for 24 hours, so you will need to act quickly! The daughter of a meth kingpin faces the most difficult choice of her life --- family loyalty, or freedom. 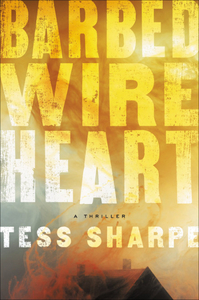 Set in a harsh and insular rural community reminiscent of WINTER'S BONE, Tess Sharpe's powerful debut, BARBED WIRE HEART, is a breathtaking "ballad of survival sung by a voice you'll never forget" (David Joy). Never cut the drugs --- leave them pure. Guns are meant to be shot --- keep them loaded. Family is everything --- betray them and die. Harley McKenna is the only child of North County's biggest criminal. Duke McKenna has run more guns, cooked more meth and killed more men than anyone around. Harley has been working for him since she was 16 --- collecting debts, sweet-talking her way out of trouble, and dreading the day he'd deem her ready to rule the rural drug empire he's built. Her time has run out. The Springfields, her family's biggest rivals, are moving in. Years ago, they were responsible for her mother's death, and now they're coming for Duke's only weak spot: his daughter. With a bloody turf war threatening to consume North County, Harley is forced to confront the truth: that her father's violent world will destroy her. Duke has raised her to be deadly --- he never counted on her being disloyal. But if Harley wants to survive and protect the people she loves, she must take out Duke's operation and the Springfields. Blowing up meth labs is dangerous business, and getting caught will be the end of her, but Harley has one advantage: She is her father's daughter. And McKennas always win. A remarkable novel with a deep emotional core, BARBED WIRE HEART seamlessly blends page-turning suspense with a multilayered and unflinching portrayal of a poor, rural community where family is everything. - Click here to read a review. - Click here to read an excerpt. - Click here to visit Tess Sharpe's website. - Connect with Tess Sharpe on Facebook, Twitter, Instagram and Tumblr. This is a special newsletter for our Spring Preview Contests, which will mail on select days through April 19th. This newsletter is separate from our weekly Bookreporter.com newsletter, which mails every Friday. You can subscribe to that newsletter here.